Finally got out for my first foil. Sail: 7.5 Ezzy infinity, rigged slightly for lighter winds. Fist time I was out winds were 15 gusting 24km. Felt really freaky when I did start to fly, it only lasted about 2-3 seconds before I had a shaky landing. I had a minor catapult near the end of that outing. I was flying hook in (bad idea). Second time out winds were lighter 10km gusting to 18km only planed in the gusts and had to pump hard mostly quickshort pumps as your body is more upright then normal. Had a few flights that lasted 5-6 before I returned to the water. My finding were; you need to keep your weight back to generate lift from the foil, I had all straps in the most outboard position but used the chicken strap in the middle and placed my front foot just behind the front strap still need to play with foot positioning may try without back strap next time maybe. My mast foot was almost all the way back ( covering the serial number) which is where I normally put it, as the track position on this formula board seems too far forward IMO. It is tricky to keep flight probebly techniqe. The foil was in the box pritty snug and I noticed some small fiberglass flakes on the inside front of the fin box cleaned away loss bits. Hopefully the boxes intagrity is still ok? Will keep an eye on it but i did not see any super conserning, Maybe it is just the box fiberglass finish? Overall super cool. It gives you that first time planning felling again except ×100. Can't wait for my next flight! J have found that their is a learning curve to foiling. Just like learning to windsurf, conditions play a part in the learning process. I am finding that the minimum wind I need to get airborn is lower than what was needed when I first started foiling. I also know that I still have a lot to learn. Very good point. Some windsurfers seem to expect that they get the "early-planing on a small sail" benefits right away, and are disappointed when it does not happen. After windsurfing seriously for about a decade, I find that I still make progress in being able to plane on smaller gear, but I'm nowhere near as efficient as some of the really good guys. Gear choice is another issue. Windsurfers who use the same board in any conditions are very rare; many switch to a better suited board if the wind changes by a few knots. Thinking that one foil will work well in all or most conditions is overly optimistic, especially since reducing the wetted surface area to reduce drag is not really possible on a foil. Around 12 years ago, Dept. of Fish and Game netted a sturgeon at Lake Sonoma about 40 miles North of here. It was healthy, and over 50 years old, and measured out to 21 FEET long, and over 1200 lbs. 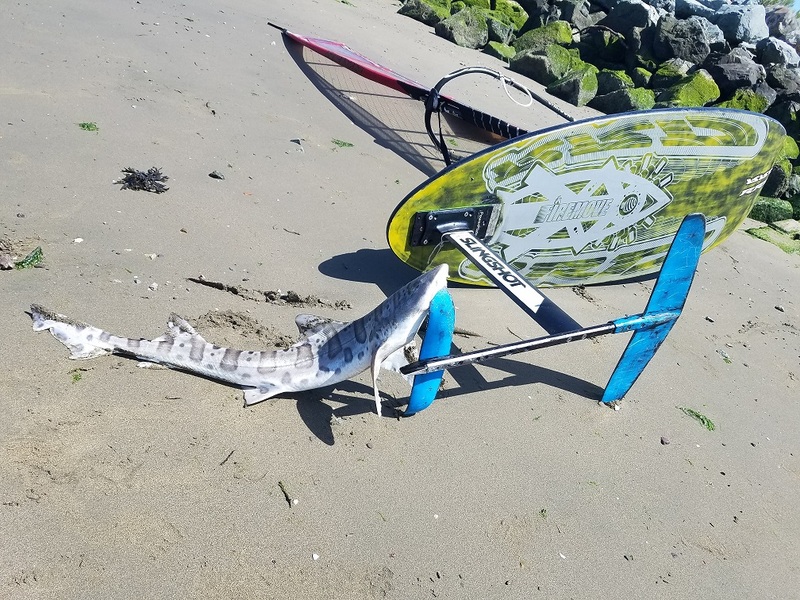 Scientists determined that sturgeon were salt water fish, so they trucked it 25 miles to San Francisco bay, where I windsurf, and released the poor fish. 5 days later, they found the now dead sturgeon within one mile of it's release point. It drowned in the 6% salt water. bert, How is that RRD board working out? Looks like my 110L Firemove. Yes, that is the 110L Firemove. Besides being a good all round windsurf board it's an awesome foil board. I favored its width (75 cm) over my JP foil board ( 85 cm). Sadly, the single bolt foil attachment will not hold up if you hit something hard, which I did early this season. The foil sheared off but was tethered to the rear footstrap, otherwise the foil would have sunk to the bottom of the San Francisco Bay. I'm thinking about installing a deep tuttle box onto the Firemove next season. The foil sheared off but was tethered to the rear footstrap, otherwise the foil would have sunk to the bottom of the San Francisco Bay. How are you tether foil? Is that loop at base of mast on picture your tether?